I was born in Farnworth on February 17th 1927. I lived in Railway View, Moses Gate, next to the railway. It was a busy line. My father was an engine driver, based at Bolton, and was always on shift work. My Grandfather Michael Moore was Irish, born in Co Clare in 1857. He came over in the 1860's to Wigan. He was a miner, and started work at 8 years old in a coal mine. He used to open a trap door to let miners out, and sat there in the dark with a lamp. He joined up in 1870, won the Godiva star and fought in Zululand, South Africa and Egypt. He was at the bombardment of Alexandria and the Battle of Majuba Hill. He was an instructor in World War 1, based at Felixstowe. 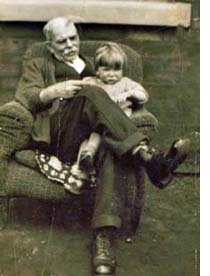 His son, Tommy Moore, worked at Mosley Common Pit, and enlisted aged 16, as a drummer, in the Loyal North Lancs. Regiment. He was killed in action on the Somme aged 16 in August 1916, and is on the Farnworth War Memorial. My Grandfather was one of the founders the Old Vets, for vets of the colonial wars. In 1912 the Old Vets was formed. Two cottages on the same site were knocked together to form one. I was made an Honorary Member in 1945, when on leave. My Grandfather was buried from the Vets in 1946. I went to St Gregory's. On walking days at St Gregory's you had to have a brown cord suit. In the 1930's, someone with six kids could not afford it. We all looked like a band of monkeys. Father Cobb used to walk at the front, as we walked up Market Street. Father Cobb was a fanatic. He used to arrange marriages. "What are you marrying that girl for?" he would say. Why don't you marry a girl you went to school with? (Father, that would be like marrying your own sister). You had to marry a Catholic or there was no marriage according to him. Canon Holmes was virtually a saint. He was kindly, from a wealthy family. He gave all his money away to the poor and needy. Any unmarried girl getting pregnant was then a terrible thing, Canon Holmes exploded, "They come over from Ireland green as grass, walk down Market Street and they are in the family way", he would say. When I left school at 14, I worked in the building trade, for Bradley's- Civil Engineers. I mostly worked for them on government work, making Nissen Huts, because the war had started. I joined the Army when I was 17 in 1944. I went abroad, Austria, India, all over, and I came back to the building trade. I was a steel erector etc. and worked as a miner at Mosley Common for ten years. After Railway View I married and lived in Macdonald Street, the next street to Railway View. A lot from that district were killed in WW1. I personally knew lots who were killed in WW2. An Irishman Tommy McClaughlin was killed in Normandy. A lad called Gordon Ainslie was killed in Caen. From the next street, Alf Rule was killed, and Jimmy Bradley was killed at Anzio, also Eckersley, and Riley. I remember them all. There were four unsolved murders in Farnworth. Before the First World War there was an ex policeman called Reuben Mort. He travelled every day from Little Lever up Hall Lane to Farnworth. Then one day he was found battered to death in the cottage he lived in Little Lever. They never got anybody for it but one of the suspects was the local blacksmith. I don't know why. He was a powerful man. Reuben Mort was no chicken so the murderer had to be very strong. The next murder was a lady found behind the Savoy. In 1944 Sheila Fox disappeared. She must have been murdered. In 1948 Quentin Smith was murdered. There was lots of police activity, but they got nowhere. People were afraid, but there was no repeat. Hall Lane was then full of houses. There would be a bang on the door, and then when the door was opened you would hear footsteps running away. No one was there and people were terrified. Boggart is a Lancashire name for a poltergeist. My theory is that it was the workings of Ladyshore colliery nearby. As the ground settled, it shook everything and vibrated like someone walking along. Tom McGuffie lived in Gower Street. He was our wrestling instructor at Bolton United Harriers. Before WW1 there were two brothers. 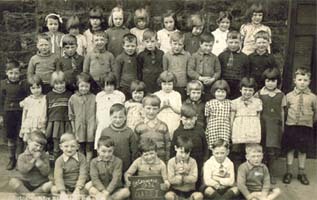 One of them lived near Larkhill in the cottages. All the wrestling was done at Larkhill. I've wrestled there as an amateur. Two brothers were in a very close match. One of them used to live in cottages which had, you know, these old fashioned locks, like a penny latch. He used to rattle that and his brother would come out. Tom was there that day to referee. They put a mat down on Lark Hill and they were wrestling. He picked him up in what we call a leg and arm. Then he reversed it. In most styles of wrestling when shoulders touch the mat you are finished so what you do is go into a bridge, supporting yourself with the crown of the head and your heels, and arching your back to stop your shoulders touching the mat. Greco - Roman wrestlers use it all the time. It's very dangerous. He instinctively fell into a bridge and it broke his neck and killed him. They used to say that the other brother didn't live very long after that. Old people used to say that at these cottages the latch used to start rattling, when nobody was there and it was his brother come to start wrestling. It was just the wind. Just after World War One Spanish flu killed many people, and my brother caught it. The side effects made people zombies, some completely paralysed, some partially. This strain interfered with the brain. and your arms and legs went. The ward was full, they called it encephalitis. He got over it but not completely. 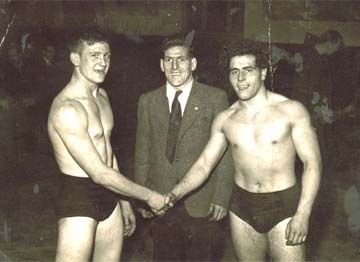 I started wrestling at 14 with Bolton United Harriers, a sport I liked. 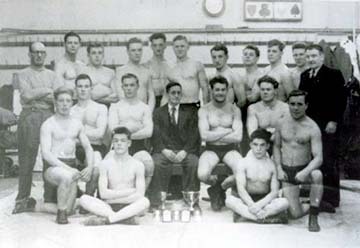 There was no club in Farnworth but there were schools of wrestling all over Lancashire. By the time I started wrestling for money was over. There are 3 styles. Lancashire Catch as catch can, Cumberland and Cornish. Cumberland is still going, and money changes hands. Its all oriental arts now like judo and ju-jitsu. I was wrestling for along time. I later trained under Billy Riley at Wigan. He was the top man as far as wrestling goes. Later Bolton produced some top showmen. Anyone who thinks the stuff they see on television is real belongs in a psychiatric ward. It's an insult to common sense. From the age of 14 I won lots of amateur competitions. I finished in my 40's. I wrestled for the British title once at Bolton Grammar School, against a Metropolitan policeman. He was 45. I did everything, and I thought I'd crucified him. I couldn't get him on his shoulders. They gave it him on points, and one fellow said it was the worst decision he'd ever seen in his life. 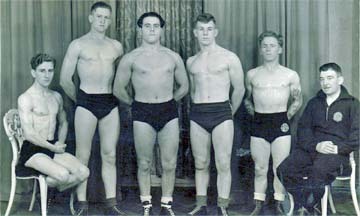 Tom MGuffie always said he produced 13 amateur wrestling champions. 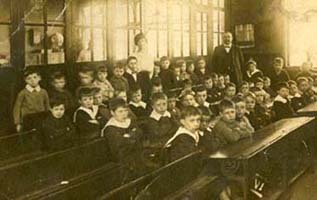 He lived in Gower Street, and had 12 children. 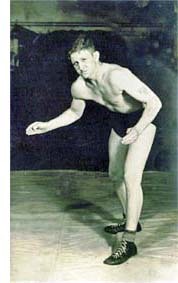 Walter, one of his sons, won the British title. He died a couple of years ago. I'm not sure if any of the others are still living. He was always on about his wife's health being poor but she outlived him by ten years. One man lived in Princess Street and he was called Bulldog Bill Clayton, Tommy knew him, Bulldog Bill died 1936. A man argued with him and he held his nose, squeezed it and broke it. He used to practise on potatoes. I've heard of Pea Morley. My dad talked about him. He lived near the Rawson Arms. My father remembered Buffalo Bills Wild West show coming to Farnworth. Near the Freemasons Arms one night, he found a Red Indian drunk asleep on the doorstep. Opposite the pub was a tripe shop owned by my father's parents. At six in the morning Grandma always went to the Free Masons for two pennyworth of rum and coffee. Sitting Bull was part of Buffalo Bills circus. He went back to America and said "I've been over the water to the land of the great white queen.. I've seen many fantastically dressed people, fantastic buildings, but all around the buildings are hungry children with no shoes on their feet. I've never seen that in an Indian village - there are no hungry children." My grandfather told me a story. There was a circus in Farnworth with a performing bear. The keeper put the bear in a shed near the Palace for the night and left the window open. A man climbed in, thinking there was something worth stealing, and jumped on top of the bear. It was a rude awakening. I'll tell you about an aunt and uncle of mine. My aunt's first husband was killed in WW1, and she was left with two boys. She remarried a coal merchant called Joe Dickens, and he had a shire horse and cart. He went to a horse auction, and bought a new horse but was advised it was a bit frisky. He was taking coal round Ash Street, near the railway, and a train noise startled the horse and it pulled the coal cart over him, and hurt his back. He ended up in hospital. Mother went to see Alice, her sister in law; and said the horse was in stables, in Lorne Street. (they are still there). She was warned not to go, but took no notice. I think she went to feed it wearing carpet slippers You never see a farm labourer go in quietly. He always sings whistles or makes a noise. It turned suddenly, and knocked the bowl to the ground. It frightened it, and it lashed out with it's back legs. You are dealing with a creature as strong as an elephant. She was less than 7 stone, and it battered her to death. There was nowt left of her. She only lived a few hours, there was nothing left of her stomach. They wanted to send the horse to France for war service, but the RSPCA said no and put it down. Uncle recovered. It was about 1939/40. I never wanted to move from Farnworth, the Army put me off travelling. Farnworth was friendly in the past, though in the 1930's there was lots of violence, But it was 'one on one' slugging it out. I always used the library, I was a big fan. Mr Slinger the Chief Librarian was a relation. There was a corner shop on every street, but supermarkets have killed them off.Cinemas were the Hippodrome, Savoy, Ritz, Palace, and Empire. Tognarelli was a very charitable man. He gave a lot to the Catholic Church, and was a good businessman. He opened an Ice Cream parlour and then a bus route. People went there after drinking, for coffee, and also to Powells, which was opposite Littlewoods. They were open after the pubs shut.